This 2019 image of the most famous lion in Kevin Richardson’s sanctuary - Vayetse. I hope it will strike an emotional chord with all lovers of the lion and remind us that the eyes are the windows to the soul - whether they be the eyes of a human or the eyes of a cat. Of all the truly iconic animals that we cohabit our wonderful planet with, the African lion is the one that many informed people are most worried about in terms of survival. Numbers are now less than perhaps 16,000 - just 5% of 100 years ago. To be so very close to this majestic lion was a privilege, but it was hard earned. Kevin and I have worked with each other for 6 years and there is great mutual trust. His team worked on the cage placement deep in the flooded gorge during the heat of the day and I then had the easy bit of just getting wet from 4pm onwards. I knew that I wanted a contextual backdrop and I also knew that I needed to work with consistently flat light on Vayetse's face. The key was to convey a sense of place, but also take a portait with an intoxicating level of facial detail. The busy river background is not maybe my normal style, but in this case it helped - after all , I am in his “Kingdom”, not a studio. As always, my starting premise was that I needed to be lower than his line of sight - this meant being in 4 feet of water. The Nikkor 58mm lens is optically in a league of its own for this kind of work and I think it shows here. 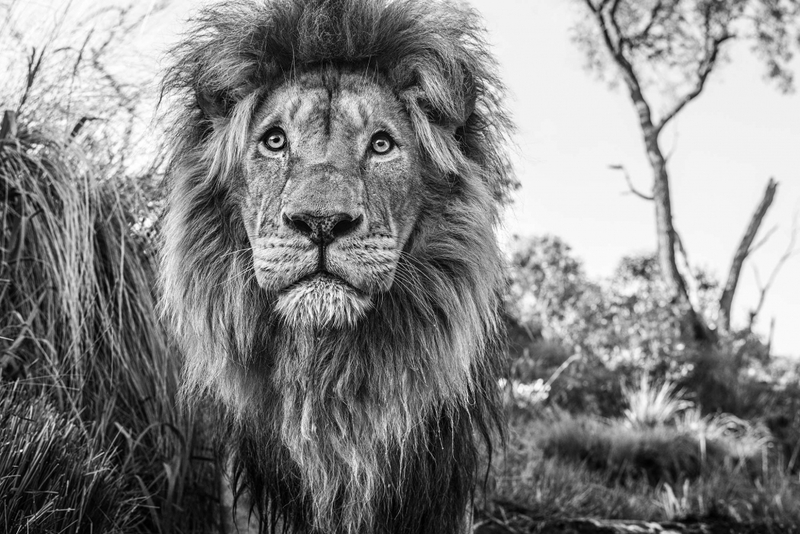 I hope that this photograph will find good homes and in so doing raise awareness and also funds for Kevin’s relentless crusade to fight for the survival of the Kings of Africa. I had the easy job, albeit the wet one. Kevin’s job goes on day after day, whereas I just come and go.